Each earthling human body is composed of literally trillions of individual cells. The nucleus of each cell contains all the information necessary to create an exact replica of our human body. This chemically encoded information is stored in a vast, tiny archive known as DNA (deoxyribonucleic acid). DNA is composed of chromosomes and genes that, in addition to being an individual human blueprint, carry ancestral and cultural imprints and codes for every conceivable human trait from our evolutionary past. This vast archive of information is passed along through a replicating process that involves the copying and encoding of genetic information from DNA to RNA (Ribonucleic acid). The original DNA that is housed within the nucleus of our cells programs instructions for the production of enzymes and proteins. These DNA instructions are not directly converted into proteins, but are copied into RNA. This ensures that the information contained in the DNA does not become tainted, thus preserving the archive. In addition to the over 30,000 active, working genes, scientists have discovered DNA material that appears to serve no current purpose. The technical term that scientists use to refer to this dormant DNA is “junk”. It is not, however, junk or worthless filler. It contains vast amounts of information pertaining to who we are and, more importantly, who we may become. It may very well be that the blueprint for our future memory as a species is encoded within this dormant DNA material. Our future memory premise, simply stated, suggests that contained within the DNA material that rests in a dormant state, waiting to be activated, is the evolutionary instructions for humanity’s future development. The intriguing aspect of this theory is: Can the activation of these dormant segments be predicted? How and when do these dormant sections get activated? What is the evolutionary trigger that unlocks these dormant sequences? And lastly, can the dormant information within our DNA be consciously manipulated by the individual? It is possible that the first question, the predictive aspect of activation was addressed long ago by ancient Chinese philosophers. Fu Xi became the first Emperor of China, circa 2800 BC. One day he spotted a dragon-horse rising out of the Yellow River. On its side were some markings which Fu Xi recorded. He called them the Ho Tu, from which he derived eight trigrams which represented the four cardinal directions and the diagonals between. These eight trigrams are the basis of the I-Ching, the oldest scripture in Chinese culture. 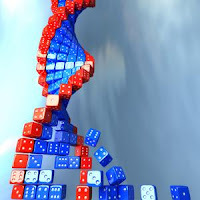 Several modern books like the “Tao of Chaos” have demonstrated extraordinary similarities that link the I-Ching to modern knowledge of DNA structures. Basically, DNA comprises of four code letters, A, T, C and G. These are combined into sets of three, known as codons. This means that there are 4 x 4 x 4 = 64 combinations available, and the I Ching also has 64 combinations. Our genetic information is encoded in the sequence of nucleotides arranged into codons consisting of three bases each. DNA has sixty-four letters or codons (nine overlapping 8 note octaves) in its spiral structure. There are also 22 letters in the genetic amino acid/protein creation process (three overlapping 8 note octaves) with one RNA codon for each of the primary 20 amino acids plus the start and stop RNA codons. Further, each of the sixty-four DNA codons contains four bases with only three active at any one time. The I Ching, like DNA, has four two-line bases of which only three are active. The I Ching is based upon the polar aspects of Yin and Yang, DNA is based upon the plus and minus threads of the double helix. The two three-line hexagrams of the I Ching have the same tri-part structure as the DNA codons. Further, beneath the electron microscope the I Ching symbol looks like the head of the DNA snake, as if it had been visualized thousands of years ago during profound meditation. It is easy now to perceive that the structures of DNA and the I Ching have a similar purpose. DNA is used to construct a biological organism, the living expression of the quantum information fields. The I Ching is used to create an awakened being grounded in the dimensions of consciousness. Together they suggest that there is one shared cosmic-mind behind the sixty-four codons of DNA and the sixty-four hexagrams of the I Ching. The quantum information field surrounding DNA, the templates of the I Ching and the profound awareness of the Tao are all names for the same underlying stratum of consciousness which carries our manifest universe, just as an ocean carries a wave upon its surface. The I Ching of China describes the universe in a similar way to modern western science with its study of DNA, the atomic structure and the quantum light fields. We can but marvel at the extraordinary minds which put these three ancient creation models together. Modern physics suggests that time does not exist on a fundamental level. Put more precisely, an object in 3D over time is the same object, while in 4D, the perceived object is a different entity at different points along the time-line. Time can only be experienced from the perspective of a perceiver. It follows then that DNA would possess past, present & future aspects of our object in question as the mechanism of the differentiation. DNA is the means whereby an organism (perceiver) changes (evolves) over time, while maintaining organic continuity. The ancient I-Ching appears to be a sophisticated model of the tendencies of evolution, as generated by DNA. In part two of this series, we will explore some of the questions raised in this installment. Specifically, can the dormant information within our DNA be consciously manipulated by the individual? like 'quorum sensing' (we're like yeast in our totality) - perhaps we'll be 'activated' when our population becomes a certain size - and those that know, would do anything to keep that population down. The interesting question: What is the trigger?